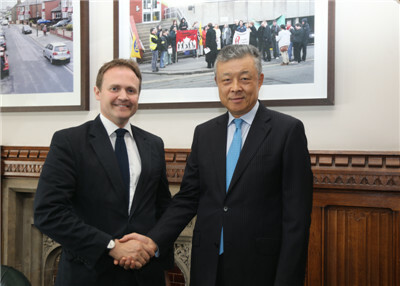 On July 4, Ambassador Liu Xiaoming met with Tom Tugendhat MP, Chair of the Foreign Affairs Select Committee of the British Parliament and exchanged views with him on China-UK relations, inter-parliamentary exchanges between the two countries, and international and regional hot issues. Ambassador Liu said that China-UK “Golden Era" has been accelerating with remarkable results in their cooperation in various fields. China will firmly adhere to the path of peaceful development, continue to expand its opening up to the outside world, steadily advance Belt and Road Initiative, share development opportunities with other countries, and promote the building of a new type of international relations and a community with a shared future for mankind. China attaches great importance to the inter-parliamentary exchanges and cooperation with Britain in the hope that the Foreign Affairs Select Committee led by Tugendhat will play a constructive role in promoting the exchanges between the two legislative bodies, enhancing understanding and cooperation between the two countries and contributing to a more strategic, practical, global and inclusive China-UK relationship. Tugendhat spoke highly of the relations between Britain and China and the important contribution China has made to world peace and development, saying that there is a huge potential and broad prospect for the inter-parliamentary exchanges between the two countries. He and the Foreign Affairs Committee are ready to enhance exchanges and cooperation between China and Britain to achieve continuous progress in the “Golden Era”. The two sides also exchanged views on Belt and Road Initiative and the situation of the Korean Peninsula.